At Plum Creek Archery, we carry a variety of bows from top manufacturers throughout the industry. From traditional longbows and recurve, to modern compound, as well as crossbows and bows for fishing. Looking for something specific or not sure what you need? Not a problem. Ask any of our helpful store associates for advice or help in locating what you need. We want to be your source for the equipment you’re looking for. 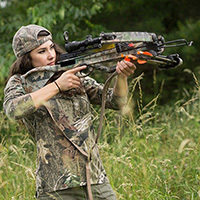 At Plum Creek Archery, we carry the top brands of crossbows. Stop in and check out our selection. If you don’t see what you are looking for or the brand you want please be sure to ask one of our associates. We can get what you need. 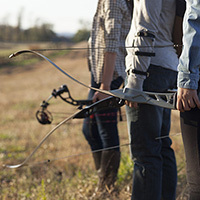 Recurve bows are a traditional style of bow with curved limbs at the ends of the bow, which help deliver energy to the arrow, increasing its speed. These bows are popular in the Olympics and other competitive events. 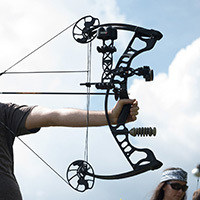 Want to try out a modern recurve bow? Not a problem. Just stop in and ask any of our helpful associates. They would be glad to get you started. Forget the rod and reel. Bowfishing is just that: fishing using a bow. 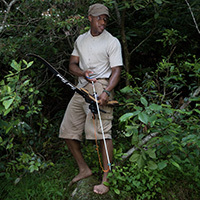 Bowfishing bows can be traditional or compound, and the arrows used are typically heavier and stronger than other arrow types, are barbed so they do not pull out of the fish, and can be attached to a line so the fish can be reeled or pulled back to the archer. If you're interested in different type of fishing, ask any of our helpful associates about bowfishing bows, arrows, accessories, and other helpful advice.